Click the image above to view the entire schedule. Despite the piles of snow on the ground, spring is right around the corner and that means it’s time for softball in Minnesota. The 2019 season opens on March 26, but one of the busiest early season days is a week later, April 2, with 59 games slated, including a Metro East Conference tilt between North St. Paul and Mahtomedi. The Polars, who lost just a pair of regular-season games a season ago, met the Zephyrs twice last year, with North St. Paul winning both contests. Despite their early run of success, the Polars' 2018 campaign ended against Stillwater in the Class 4A, Section 4 playoffs. Two-time defending Class 1A state champion New York Mills starts its road to a possible three-peat by opening play against Menahga, while Stillwater, which won the Class 4A state title last year as the No. 7 seed, launches into Suburban East Conference play at Roseville on April 4. Faribault, which claimed last season’s Class 3A title thanks, in part, to the arm of then-junior pitcher McKayla Armbruster, seeks to make a case for Big 9 Conference contention when it opens league play April 4 by hosting Albert Lea. After coming up short in previous seasons, Maple Lake capped a 28-1 campaign in 2018 with the Class 2A crown — and the Irish return to action April 4 against Section 5 rival Norwood-Young America (the team that handed Maple Lake its lone defeat). The state tournament returns June 6 and 7 to Caswell Park in North Mankato. 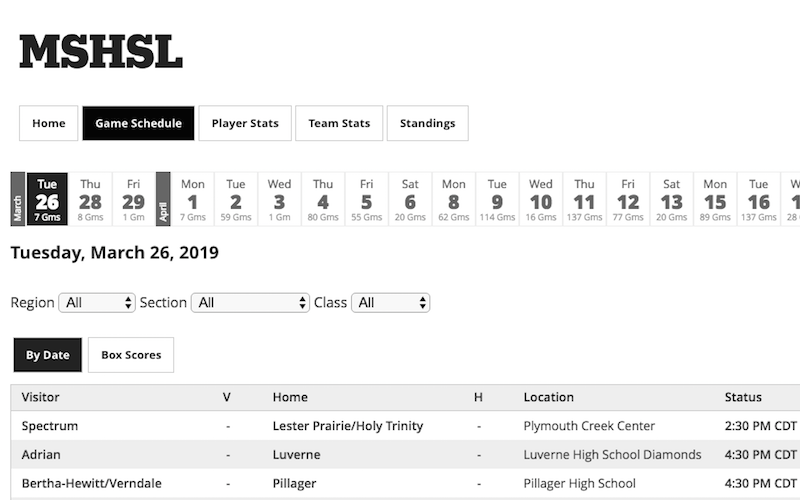 Click here to view the entire schedule, or type the name of your favorite squad into the “Team Finder” box at the top right corner of the page for a specific schedule. If your team’s schedule isn’t posted or needs updating, send the necessary information to scores@sportngin.com.